Istanbul Modern Cinema hosts the first Canlandıranlar Festival organized by the Canlandıranlar Association in collaboration with Puruli Culture Art. The festival’s first guest is Nelson Shin, creator of the “lightsaber” in the Star Wars series, director of “The Transformers: The Movie” and “Empress Chung,” and producer of The Simpsons Movie. The festival presents two feature films by Shin, besides a special selection from the “Pink Panther Shorts” for which Shin worked as an animator at the start of his career. Shin will have a talk on Thursday 25 April, 19.00. The festival will also host the selections “Best of ASIFA” by International Animated Film Association that includes animation professionals from 52 countries, and “ASIFA Korean Selection” which features recent South Korean animations selected by Shin. 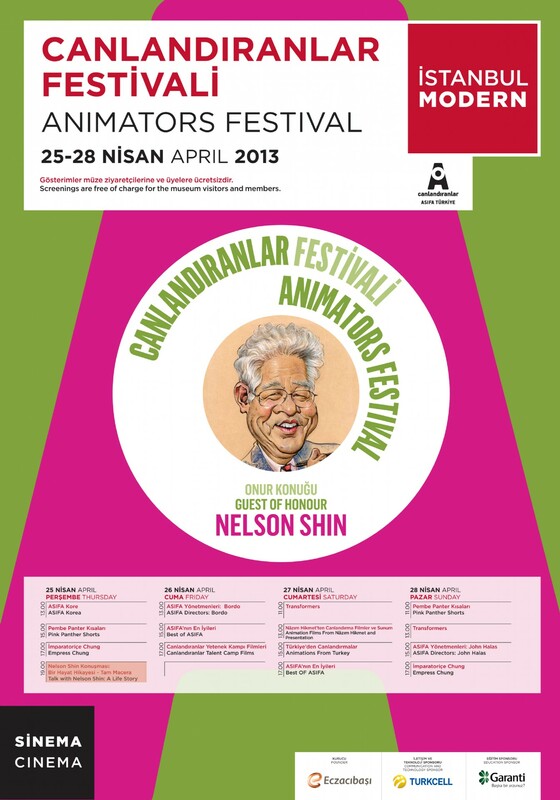 Also included in the program are Canlandıranlar Talent Camp films that garnered more than 30 awards in national and international festivals, and Animations from Turkey, which presents a synopsis of the history of animation in Turkey. Nazım Hikmet, who breathed new life into Turkish poetry, is also known to have penned screenplays for the Turkish cinema, and collaborated on a variety of films under pseudonyms. The short animations he wrote and collaborated on during his last years in the Soviet Union were unearthed after 50 years by M. Melih Güneş in 2013, the 111th anniversary of Hikmet’s birth and 50th of his death. Also included in the program are animation films of the Nazim Hikmet tales Peace to Your House and Cloud in Love. There will be a presentation by Melih Güneş and Tan Oral prior to the screening. Based on a Korean folk tale about a daughter who sacrifices everything in order to save her father's sight.This is Nelson Shin’s first independent feature film after spending many years working for Hollywood’s internatioanlly successful productions. This film isthe first film to have been released simultaneously in both North and South Korea. It is the year 2005. And the battle between the heroic Autobots led by Optimus Prime and the evil Decepticons led by Megatron and StarScream. Two warring factions of transforming robots from the planet Cybertron. The Autobots must save their home planet from an evil entity known as Unicron, who’s ready to consume anything that stands in its way. At the same time, they must defend themselves from an all-out attack from the Decepticons.In this memorable filmfor several generation of childrenthe voice of the Unicron belongs to Orson Welles the multi taleted cinema genious. The Pink Panther is a responsible caretaker in a national park. One man and his dog comes to the park and he ignores a sign that says "no open fires" he chops it down and uses it to start a fire. Pink sees the fire and puts it out. The man comes back and sees the fire has been put out, he accuses his dog which the dog denies. The Pink Panther is strolling the streets of Italy when he spots Leonardo da Vinci painting what appears to be his newest masterpiece, the Mona Lisa. Da Vinci paints a grumpy mouth on the Mona Lisa, but the Pink Panther decides to covertly replace the frown with a teeth-filled smile. A zoo elephant breaks free of its tether and follows The Pink Panther out of the zoo. Pink orders it back, but the zoo is closed. Sympathetic to the elephant's sadness, Pink takes it home. The Pink Panther, who works at a ski resort, meets the little pointy-nosed man, who is a newcomer on skis and reads a guidebook in order to learn how to ski. While taking a stroll through a local park, the Pink Panther comes across a small bird looking for a ride south for the winter. It soon becomes apparent that the little fellow cannot fly and, what is worse, is scared of heights. The witty panther then goes about devising several ways to get the bird in the air. The Little Man Tarzan, feared King of the Jungle but henpecked husband of Jane at home. When Jane orders Tarzan to get her a pink fur coat, he sets out to capture the Pink Panther. The Pink Panther sets camp for the night leaving a serving dish containing a cake for breakfast. During the night, he sleepwalks and eats the cake in his sleep. The next morning he finds the cake missing and thinks a thief pinched it, so he gets out a Sherlock Holmes-styled hat and a magnifying glass and tries to track down the thief. Pink befriends a fish at the beach who begs for bits of his sandwich. The fish follows him home, but Pink demands he return to the ocean. After the fish fetches his newspaper, Pink decides to adopt him as a pet. The Pink Panther longs for a pet, but has not a dime to his name. A suspect man in a street corner fools him into buying a rock as his pet. The panther adopts the rock anyway, and it immediately takes on a life of its own. It is a story of growing up and maturing, of anxiety and ambition illustrated through a tale of shoes. It is about the unknown that nudges us through life - an invisible pebble lodged in the shoe that through pain and discomfort brings awareness and meaning to our existences. How the friendship could happen between a farmer and a snail? This experimental animated film explores a world of Kafka's metaphors in which society is reduced to absurdity. An anonymous and discrete man sits in his regular cafe, after work, killing time. While smoking endless cigarettes, he observes. A lost nomad with his camel in the desert searching for a shoe! Two chicks are born into a cruel world. The cocky one is quickly killed by the brutal peasant woman, whilst the quiet one keeps his head down and lives a rich and unusual life. CafeKa is a short animation film that mixes two techniques: traditional 2D and stop motion. It plays in its title with the word 'Café' (in Portuguese, it means Coffee), the starting point of the animation, and The Metamorphosis's author name, Franz Kafka. This story begins romantically, continues as a farce, turning into a thriller, but ends up as a high tragedy. Unable to afford to go on vacation because of sudden expenses, a frustrated husband decides to take a vacation in his basement, in a box. When Mariza, the stubborn donkey refuses to climb the steep road of their Greek island, the old fisherman convinces her with Zorba's dance. What we gain and what we loose when we follow the fashion. In this short biographical animation inspired by the exile of Stalin, a lone bear rides an abandoned train through the frozen Siberian wilderness. And a rabbit jumps in. Sleepincord raises the issue of dream. Dream is the meeting point of the world of body and mind; it is intangible for us and hard to examine thoroughly. It happens inside but, at the same time, outside of us and, therefore, gives rise to anxiety. The main character feels familiar with his new house in a strange way. While unpacking, he finds his old book and begins to bring back some of his old memories at some imaginary park in his past, especially, about his previous lover. However, he fails to recall her face after all. A wolf appears in a peaceful animal village. The wolf starts to fence around a land and lets nobody come in. This fence causes inconveniences to animals and village people. When there was a fire in his land, animals get together to get rid of the fence. There are four important items for scholars and learners when they study and do research in their libraries, brush, ink, ink stone, and paper. We call them the four precious things in the study, Moon Bang Sa Wooi. The Joseon people called the library or studying room, Moon Bang and valued the items used in the Moon Bang, as the name indicates. "To be a grown-up, you've got to get out of the water." With this, the tadpoles disappear. Noodle Fish, a friend of them begins his journey for the world outside the water. At the river-mouth he meets several fish and asks them how to get out of the water. Long ago, a talented boy called Mai An Time was sold into slavery to King Hung. Recognizing his talent and diligence, the king cherished him very much enough to give him a public office and make him get married to his foster daughter. A wolf comes to a village where monkeys and pigs have lived peacefully by building a plant for tinned food. The plant pollutes the village day by day and pigs and monkeys decide to kick the wolf out of the village. The conversational interview with the old lady in Jeju Island. An animated documentary portraying about a life of the Haenyo (Traditional female divers of Jeju Island). Daily life of pictogram inside. People get together to constitute a city. Seoul is a city full of people. Let's imagine the city free from walls and frames between people and relieved of its shell. The theme is snobbery. People always like sensations more than natural beauties – even the explosive flowers. The screen is divided in eight parts and we follow the hero’s attempts to find love. The film is a train journey between two stations, the first and last. In a second class carrier the Traveller meets many people, many characters, many destinies, but he does not find a friend. The sergeant tries to transform the recruit into a right soldier, but the civilian’s conscience – the friend frog – doesn’t agree with that. This is a film about curiosity – a human sickness for which, even to this day, no cure has ever been found. The misterious bag on a bank becomes a subject of the curiosity. Six people are grouped and regrouped in front of a wall as if for a photograph. But all is not as it seems. The Man was accustomed to walking the way he was taught by his mother. His four “teachers” each try to teach him their style of walking convinced that theirs is the best way. What to do? A romance from the nonsense poem by Edward Lear. A mismatched love affair set against surreal backgrounds, this film was one of the first stereoscopic cartoons made from two optical points. Will mankind use technology for good or evil? One of the first computer animated films to tell a story. Made as 33 six-minute episodes, Foo Foo, proved extremely popular on ABC TV in the early 60s. In this award winning short, Foo Foo a typically put-upon hero, becomes a stowaway. A musically talented Ape like his predecessor King Kong is captured in the jungle and taken back to civilization. However civilization proves too uncouth for the cultured ape so he departs philosophically pondering that when the arts go out of fashion the artist must retire and wait. The adventures of Snap a paper cut out dog. One of a series of 26 childrens' films made for ABC TV by the Danish model maker Thok. A satire on technology showing a vision of the future that has turned out to be rather too accurate for comfort. Based on the drawings of Gerard Hoffnung; artist, comic and raconteur. The film follows the performance of an over enthusiastic conductor who brings the house down; literally. A film about the man quest for freedom. Just after the war John and Joy made this personal experimental film to express their feelings for freedom. Working with them on the backgrounds was another well known Hungarian / French animator the young Peter Foldes. This satire on the cinema already under threat from the rise of television uses traditional cel animation to expose the foibles of the film industry. Based on Stan Hayward's script we follow a frustrated 'everyman' on his quest for the meaning of life. Parable about the person, war and peace. For a century war destroyed everything created by the person. But time has come and hands of people can protect the world when they unite. The girl Aishe has a wonderful garden. Malicious Seifi agrees with the wind to ruin her garden. But the cloud enamored of Aishe rescues her garden with his life. It is a screen version of Nâzım Hikmet’s fairy tale. The perception of something and the initiation of a response through the nervous traffic between the brain and the organs take approximately 0.5 seconds. Hence, we are always late a half second. A line out of nowhere, a little headache and "insert coin". Child is the only existence still able to discover the meaning of 21th century modern life, cause he/she hasn’t forgotten yet. An animation on the Hrant Dink case. The struggle between an employee and his boss. The short story of a visually impaired boy. A visual experimentation on fire, love and life. The feelings of the director towards the nuclear plant planned in Turkey. The standard, mechanized, dutifully abiding and modern metropolitan member of a TV-addicted, unperceiving and un-preferring society, at the brink of losing societal values, and his extraordinary and late awakening. Made in 1970, this animation movie deals with censure, which prevented the development of Turkish cinema for a long time by blocking free thought and expression, and emphasizes that a revolutionary reaction is needed against the censure. Do people, who are represented to possess power and capacity, really have power? This is a story of “powerful toys” in the hands of “profound powers,” that direct societies in every sense. A lost, depressed man and the first steps towards insanity. With the support of Bilgi University Section for Children Projects, Berat Ilk organized an animation workshop with the children from the Emniyettepe district. A short documentary was made from these weekly meetings, where one can see these children turning their dreams and imagination into animated drawings and shapes. The most obvious borders are sometimes not the visible ones, but the hidden. A girl slips into her innerself while meditating. This film is dedicated to period pains. A place where earth and water divided by glass, there are four birds. The smallest one doesn't have wings to fly and the others make fun of him. One day, light rays on glass cause a fire. An abstract film that tells the story of the lasts minutes of a girl before dying in war, set to the lyrics of Nazım Hikmet's famous poem “Little girl”. A short documentary on the animation workshop with Berat Ilk with children from Malatya held during the 2nd Malatya International Film festival. An old lady wearing her swimsuit, has to prove to herself that she can use the diving board to get into the pool.